This past week was Suicide prevention week. Suicide rates in America are at a debilitating high, higher than they’ve been in 30 years. 1 The statistics make my heart ache for the ones who thought all hope was lost and for the ones they left behind. It’s hard to think through those numbers without being struck to my core because I was almost one of those statistics so many times. I was so fed up with this life for so long, so convinced that my pain trumped all truth and that Christ’s love for me meant nothing compared to what I had walked through, that I was ready to jump as soon as I found a cliff. But God rescued me. Over and over. Whether because of my own stupidity, because he miraculously stepped in, or because he let my fear take over and I couldn’t, I couldn’t face the other side just yet. He saved me and I’m here, living and breathing. Is it hard? Yes. But I wouldn’t trade this life with Christ for death at my own hands. I’m so thankful I can look back. I’m so thankful I am alive. I’m so thankful I can confidently say, “It’s worth it!” not because life redeemed itself but because Christ redeemed me. I didn’t keep living, I don’t spend sleepless nights in tears wrestling with darkness so I could have my “best life now!” No! I persevere because I have been called out of that darkness and into his marvelous light. I don’t give up because he won’t give up, he will finish what he started in me. I am not hopeless because the God of all hope lives inside my chest and fills me with himself, his love, joy, and peace, even when I cannot stand. There’s so much more than this. I promise you. Please, please do not give up. You sit there in your car; wet hair, wetter cheeks, shaking hands, and a plan that will kill you. One cliff, one sharp turn, one wrong move. Gone. You’re not an idiot (or maybe, right now you are) – you know what saying goodbye would mean. You know the guilt that would heap upon so many people. So you drive. Forget them. “No one understands!” you scream at the high-way, hoping it will respond with a consoling word. “I just needed help, I just needed a friend” you say through sobs, forgetting the countless friends you do have but…sometimes logic and facts seem to pale in comparison to the gaping wounds inside our chests, don’t they? The night gets darker and you get lonelier. “What about the other side? How do I know what waits for me? How do I know it’s better than this? What am I doing?” No, you won’t let those thoughts creep in for long. This, this life, is not worth it for you. Now you’re mad, but you’re scared. So you say goodbye and you go. Torn between life and death, but death is making its appeal to you once again. I know this is you right now, because, it’s been me so many times. You think you’ve seen too much darkness. You believe you aren’t worth saving. You fear that every lie that’s been whispered over you is in fact, cold hard truth. You can’t imagine life without this dark cloud following you around and you know, you know, following Christ doesn’t mean it won’t leave. There’s no guarantee, no one can promise you a pain free tomorrow. And you’re right, no one can. But you’re missing the point. It’s not about being pain free. The best things in life worth having are worth fighting for. Do you think fighting is painless? Do you think you’re going to heal without facing the past? Without owning up to all that destroyed you? Do you think he doesn’t care? Your life has value, not because of your accomplishments or because other people care about you, but because you are a uniquely made image-bearer of the God who rules and reigns over this universe. The God who knows you intimately and who loves you deeply. He does care. Are there things that are hard to understand? Pain that’s hard to reconcile? Yes! But that’s not a reason to give up! Fight! Press on! Get on your knees. He is the answer to all of your questions. Your life is also not about you. I know it’s hard to see, but, you were created to love. You were created to be a kingdom-bringer, to help turn this upside-down world right-side up. You have purpose, your life has meaning. The pain you’ve walked through, the darkness you might still face every day, it’s not meaningless. Let it drive you back to Christ, let it bring you to the cross, where he died for you so you could be redeemed, so all your brokenness could be swallowed up in the wholeness of God. Don’t do this. Call someone. Text them. Show up at their house. Do not believe Satan’s lies that your life is ruined and this is as “good as it’s going to get.” He’s wrong. Put your trust in the Crucified Savior, the Risen King, the ruling Lord, your Abba Father. He won’t ever leave you or forsake you. You may face deep, deep trenches of pain here on this earth but this is as bad as it’s going to get. We await with eager expectation and hope for the day that our Lord returns and sets all things right. There will be that day. And in the meantime, there is joy and hope found in the arms of Christ and comfort in his body. Reach out, you’re not alone, tomorrow is a new day full of new mercies, you’re not too far gone. Your future, should you choose to have one. 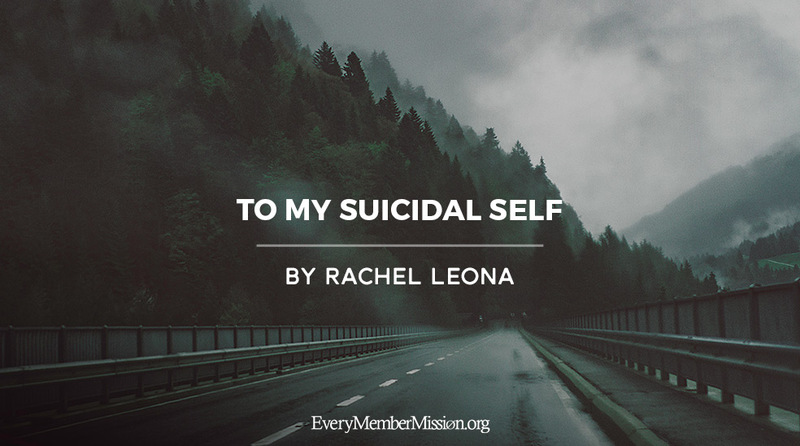 To those who struggle with thoughts of suicide – you are not alone. I’ll say it again and again. Your pain will drive you to lonely places, but those places aren’t reality, their words aren’t truth. This isn’t it. The life we see, we touch, and we feel isn’t the end all, be all. Jesus is real, his kingdom is an everlasting kingdom, and we are invited to partake in the wonders of his glory. Won’t you feast with him? Won’t you lay down your guns, put away your self-protective tendencies, and entrust yourself to the only one who is completely trustworthy? This pain isn’t the end. This darkness doesn’t complete you. Their rejection doesn’t define you. He loves you and he is worth it. Courage, dear heart, this is not the end.